Zonta Clubs and Zonta members of District 4 have been gracious supporters of the Zonta International Amelia Earhart Fellowships Fund since its beginning in 1938. This support continues to this day with the District 4 Cruise/Travel Tours. But there are other stories to the Amelia and District IV connection. 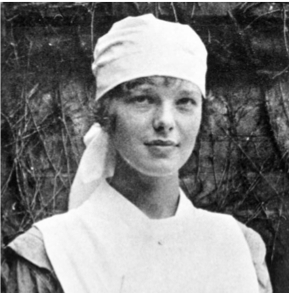 Before Amelia Earhart flew across the Atlantic, before she became a member of Zonta, before she became the world famous aviatrix, and before she was lost to the world in the Pacific Ocean during her historic attempt to fly around the world, she was living in Toronto, Canada (in Zonta District IV) where she was a nurse at the Spadina Military Hospital. In 1928 Amelia made history when in her words she was simply “sitting in the plane like a sack of potatoes” during the historic flight across the Atlantic Ocean in the plane named FRIENDSHIP. 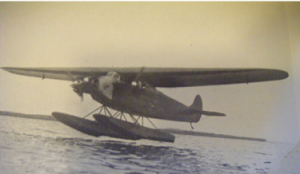 That plane was on loan to Amy Guest, who had intended to be the first woman to fly across the ocean, from Donald Woodward (of the Jell-O product family) in LeRoy, NY (in District 4). On a very cold day in January 1929 Amelia once again sat in the FRIENDSHIP at the newly opened Donald Woodward Airport in LeRoy when she came to western, NY to attend an automobile show in Rochester, NY. She also visited with members of the Zonta Club of Rochester, NY (one of the original nine clubs and referred to as Zonta Club #2). She visited with those club members again in November 1932. The Zonta Club of Jamestown, in Chautauqua County (District 4), holds a Zonta Day at the Chautauqua Institute each summer. The presentation that day is always given by a famous woman or is about a topic related to women’s issues. In the summer of 1929 Amelia landed her plane in Chautauqua and spoke to guests at the famous institute. 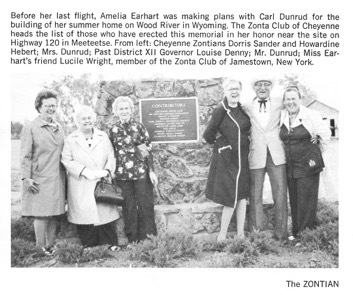 The caption above this photo pulled from a 1975 Zontian Magazine pretty much tells the story – Lucille Wright of the Jamestown Club was a friend of Amelia. Lucille often travelled throughout western NY to visit with clubs during January for their special Amelia Earhart dinners/events.